Includes shipping and insurance in U.S. Speaking of predators...I lost another chicken this evening - to an owl, I suspect. I went out at dusk to close the coop (chickens are free all afternoon), and there was one of the younger laying Production Reds - head missing, neck feathers everywhere - and still warm. The deed must have happened as they were headed for the coop for the night. 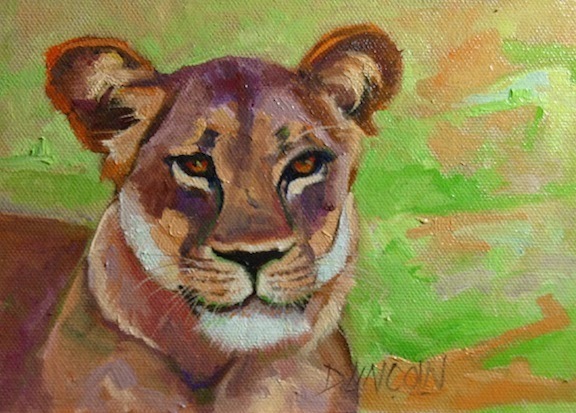 The image for today's painting came via friends who recently journeyed to Africa, and they generously shared some of their wildlife photos. Thanks, Ken and Diane! James 1:5 If any of you is lacking in wisdom, ask God, who gives to all generously and ungrudgingly, and it will be given you.